We have wanted a traditional canteen from Ruby for a long time. She makes them so well. 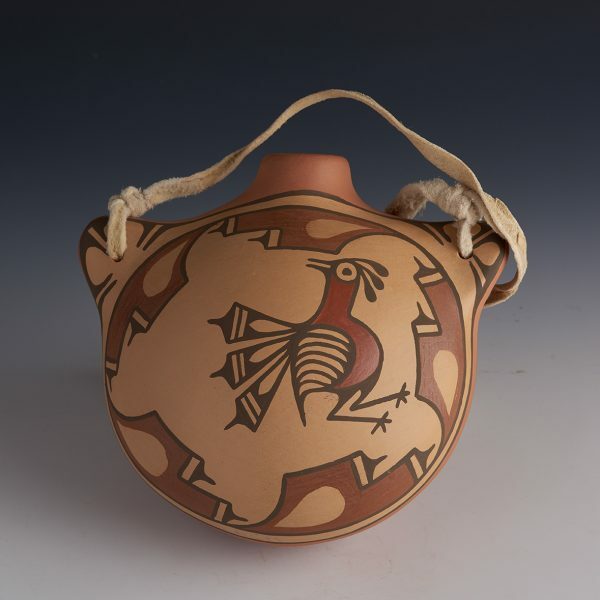 Using the same natural pigments she does in her large pots, the canteen is lovely with its Zia bird in the center, and the other painted designs around it. The bottom of the canteen is a terra cotta red, with another lighter red band above it. Those areas act like a border for the main bird design. The handles are tied with real buckskin, so one can hang it on a wall, or lay it down. For those folks that are interested in very classic and traditional forms, a canteen by Ruby fits the bill! Ruby Panana was born and raised in Zia. 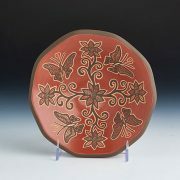 She is part of four generations of potters, learning most of her pottery from her mom, Serafina Pino Bell. Ruby went through the fourth grade at the Zia Day School and then went to Albuquerque for her higher grades. She attended West Mesa High School. 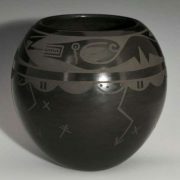 While in high school, she helped her mother with her pottery, and then began to make some small pieces on her own. She got “bored” and went on to the University of Albuquerque working towards a teaching degree. But at that point, her scholarship money did not cover her expenses, so she had to quit college. She laughs, as she told me, “I became a very good bartender for nine years, but then I really got bored!” She wanted to start a family with her husband Larry, so she quit the bartending business and started to make pottery full time in 1983. Ruby’s first ribbon was a FIRST PLACE in the New Mexico State Fair in 1985 and she has been winning awards ever since. Ruby is such a delight! Her pots are completely traditional in every aspect – materials- methods- designs… She loves her link to the past – and enjoys recreating that history in her pottery making.